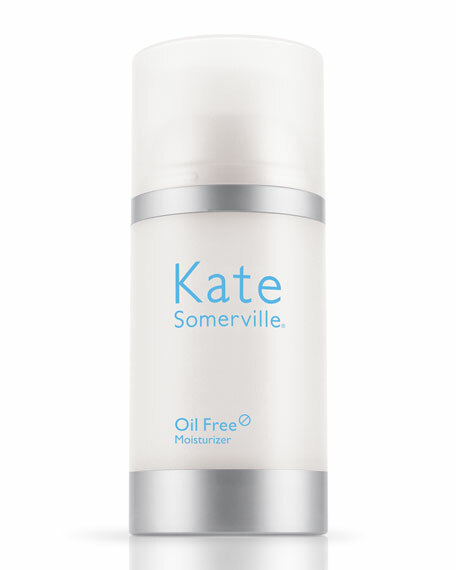 Kate Somerville Luxe-Size Oil-Free Moisturizer, 5.0 oz. Kate SomervilleLuxe-Size Oil-Free Moisturizer, 5.0 oz. Do you suffer from moisture-phobia? People with naturally oily skin often steer clear of products that they fear will exacerbate the problem. Oil Free Moisturizer eliminates that apprehension with its unique ability to hydrate, keep excess oil production in check, and provide anti-aging benefits, as well! Formulated without oils, parabens, or fragrances, this lightweight cream leaves nothing behind but smooth, supple skin. Pepha®-Tight is designed to smooth skin and diminish the appearance of fine lines and wrinkles. Sepilift is formulated to tone and tighten, while Red Marine Algae improves the look of firmness and elasticity. Sugar-based moisturizers limit essential water loss. Use twice a day, AM and PM. Use alone or layer over a treatment serum. For in-store inquiries, use sku #244779.